The recount in the race for House District 1 came down to one ballot Friday, but not the ballot people expected. 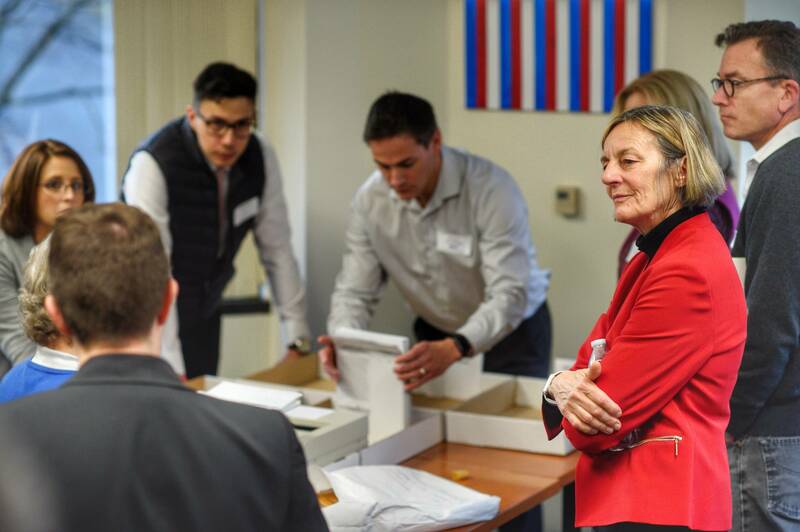 Entering Friday’s recount at the Division of Elections office in downtown Juneau, Republican Bart LeBon and Democrat Kathryn Dodge were locked at 2,661 votes apiece. Over the course of the day, LeBon picked up two votes while Dodge picked up one, making him the winner of the election, 2,663 votes to 2,662 votes. LeBon wasn’t in a celebratory mood afterward as he talked to reporters. Dodge didn’t make a definitive comment afterward, saying she and her team would “think on things.” Division of Elections Director Josie Bahnke said in an interview after the recount that Dodge has until 5 p.m. next Wednesday to file an appeal to the state’s Supreme Court. If Dodge does appeal, Bahnke said, the Supreme Court would go through the ballots one by one and come to a final decision. The race holds major implications for the balance of power in the Alaska House. With LeBon’s victory, Republicans hold a 21-19 majority in the House and now have control of the Senate, House and the governor’s office. With a Dodge victory, the House would have been split 20-20. After talk all week of a so-called mystery ballot (more on that below), the ballot that made the difference for LeBon was a ballot cast by a man who had previously been convicted of a felony, Division of Elections Region 3 Supervisor Jeremy Johnson explained. Johnson went through the history of the ballot as he spoke to a hot, packed conference room at the Division of Elections that included both candidates and a number of election officials. The ballot had initially been rejected, Johnson said, but after further investigation, election officials found that the voter’s probation had ended in June 2017. Therefore, Johnson explained, the vote would count. The vote was for LeBon. There was a great deal of discussion about the mystery ballot that was found at a polling station on Election Day, but that ballot ended up not getting counted. Bahnke told election workers at the beginning of the day Friday that the ballot should have been destroyed on Election Day. As Bahnke explained, it was a special needs ballot that was taken from the polling station out to a man’s car, where the man then made a mistake filling out the ballot. The man’s wife (his personal representative) went back into the polling station and said her husband made a mistake. The precinct chairperson told the woman to leave the ballot on the table for questioned ballots, and gave her a new ballot. Bahnke said the ballot should have been destroyed immediately, but the precinct chairperson forgot to do it. Therefore, it was left on the table. It was not counted, but it was not destroyed, prompting a great deal of intrigue and speculation about whether the ballot would be counted and potentially sway the election. For a while during the recount, it appeared it was going to come down to a coin toss. During the recount, which lasted about three hours, the candidates each picked up a vote and were tied once again, 2,662 to 2,662. The next step would be to have the winner chosen by “lot,” which basically equates to a game of chance, such as a coin flip. Then, each side submitted challenges to votes they believed should be examined more closely. After about an hour of going through these ballots one by one, Johnson came out and explained the situation around the decisive ballot. Through the first five precincts of the recount, there was no change. Then Fairbanks Precinct No. 3 came through. Dodge picked up a vote in that precinct, increasing from 248 votes to 249. LeBon’s total remained at 237. The same thing happened when absentee ballots were counted. LeBon’s total increased from 308 to 309 while Dodge’s total of absentee votes remained at 214. There was no incumbent in the House District 1 race, as both LeBon and Dodge are running to replace former Rep. Scott Kawasaki, a Democrat who left his position to run for a spot in the Alaska Senate. He won his election, another tightly contested race, against Republican incumbent and former Senate President Pete Kelly.